Diet – We provide apples, bananas, banana smoothie and at least one other fruit as the mainstay of the daily diet, with leaves 1-2 times week. Those animals with mouth damage from barbed wire entanglement will obviously require softer fruits than apple. Go to the Feeding flying-foxes section. Housing – This will depend on why the animals are in captivity. 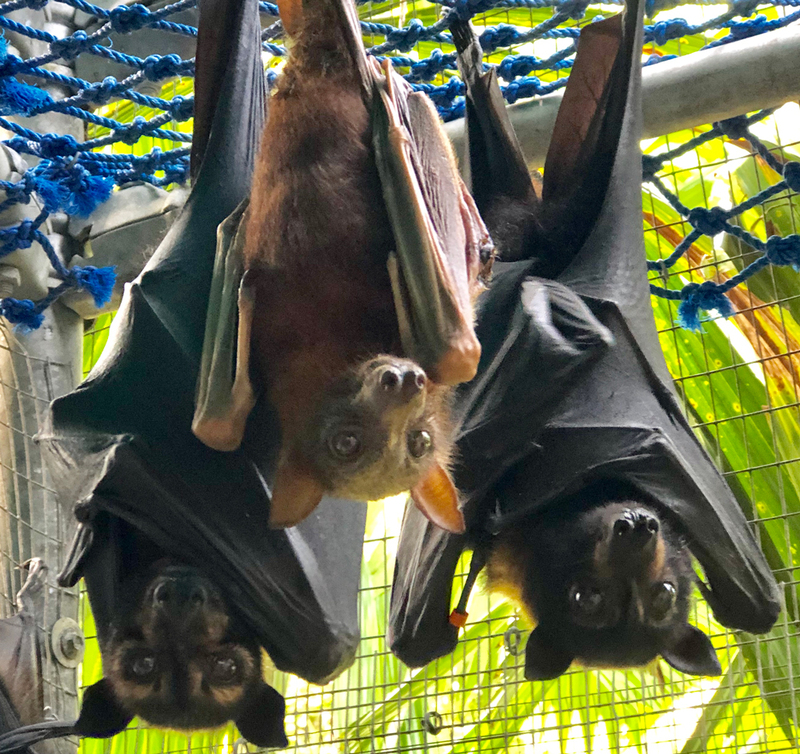 Environmental – Flying foxes need sun, protection from extreme heat (and cold) and a feeling of safety that comes with the option of roosting at a reasonable height out of the reach of humans. Social – Flying foxes need other flying foxes with which to socialise, but there are age/gender/species considerations. Our choice of the best housing will depend on why the animals are in captivity. Short-term care bats in the acute stage need to be kept in our hospital section indoors or in the lower sections of our outside cages so they can be caught easily for medications, dressings etc The hospital is mainly for animals who are sick (rather than only injured) such as those with tick paralysis, dehydration and recent surgery. We much prefer to manage most bats outdoors where they can be social, get sun etc It is vital that animals requiring rest are not put in a cage large enough to allow them to fly if they are frightened by activities in their new surroundings such as cleaning of cages. Our Treatment Cage has a feeding area that is 1.5 metres by 1.5 metres (known as Inside Treatment), connected to an outside area 3m by 2.2m (Outside Treatment). We can close the 2 areas off from each other or not. Initially we keep short-term care bats in the feeding area. Normally we’ll add a hanging towel to give the feeling of an even smaller space and block out from their field of view from human activities. Once they are used to how we present food and their surroundings we’ll open the hatch between the 2 areas and they can move freely between the two areas. Sometimes we need to have a group of bats in each area and keep the two areas closed off from each other. The two areas have some roofing for protection from rain but allows for a lot of sun as well. While in this area the bats can have a lot of social interaction with the bats free in the flight cage. If there is only one bat in this section we consider putting them in a bedroom section of the feeding area for maximal social interaction. 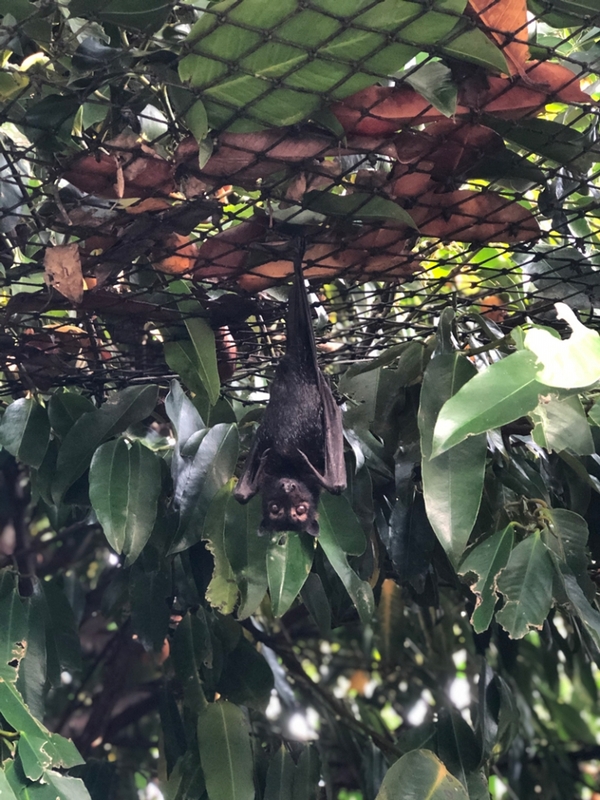 Long-term care bats are normally allowed into the large flight cage with the permanent care bats once they have recovered from the acute stage of their condition. These bats are fitted with a velcro collar so that we can find them again. We write on the collar who they are. These are often bats with wing membrane damage from barbed wire that requires time to heal (e.g. large holes and tears) and while it is healing it is optimal that the bat can fly as much as possible. Permanent care bats must be able to be independent inside the large flight cage. They must be able to climb up to the top of the 6 metre high cage, and down again to eat; to groom and toilet themselves and not require active medical management. We monitor them when they come down to eat, and do an annual checkup for weight and hygiene issues. The main problems we find are joint and wing contractures secondary to their injuries and the occasional mild fungal wings. Once used to living at the top of the cage they are highly resistant to being kept in a lower treatment area. This bat lives outside the cage with no housing. It has enough flight for a soft release. ENVIRONMENTAL Flying foxes need sun, protection from extreme heat (and cold) and a feeling of safety that comes with the option of roosting at a reasonable height out of the reach of humans. SOCIAL Flying foxes need other flying foxes with which to socialise, but there are age/gender/species considerations. Young pups are solely with their mother until about a month of age, at which point they are with their peer group at night when the mother goes out to feed. After weaning, it is normal for juveniles in the wild to roost with their peer group (other juveniles) until about their third year when they integrate fully into the adult life of the camp. So juveniles in captivity need other juveniles, and adults other adults. Mothers with pups normally roost with other mothers, and in captivity a gender balance of 6 females to 1 male is considered a healthy balance. 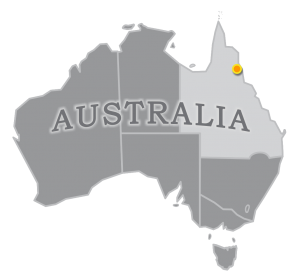 There are several places in the wild where all 4 species of Australian flying fox share a camp (Ingham and Finch Hattan in Queensland) so keeping different species in care together is not an issue. Little Red flying foxes like to roost together in clumps most of the year, and so they in particular need their own species. The other 3 larger species hang singly and I feel it is less important, but definitely preferable, for them to have the company of their own species. I have seen Little Reds in our cage cuddle up to other species of flying fox even in the presence of other Little Reds. There will always be individual friendships and preferences to take into account as well. For all these reasons I believe that flying foxes in permanent care need a minimum size group of diverse ages to thrive. Permanent care animals can be important socially for sick or injured animals in short-term care.